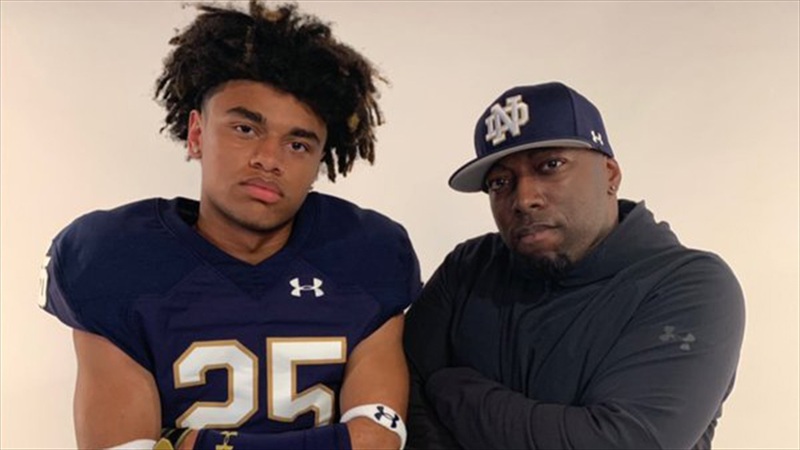 Kasen Kinchen‍ knew he would be impressed with Notre Dame coming into Thursday’s trip to South Bend, but the 2020 Washington cornerback didn’t know he’d be impressed as much as he was. Kinchen got to spend most of his time with Irish defensive backs coach Todd Lyght and assistant Brian Polian. The Lake Stevens High School standout currently has offers from Oregon and Cal among others. Lyght has asked him to remain patient with the Irish. “His message to me was to wait out the process and keep working hard and keep doing my thing,” Kinchen recalled. Kinchen made the trip along with his father, Heir Academy Football CEO Reggie Jones and a pair of Jones’ other clients, 2020 cornerback Donovan Clark and 2021 wide receiver Emeka Egbuku. Lyght will be back out to Washington to check in on the Heir Academy prospects in person next month. Kinchen also enjoyed the campus in South Bend. But it was the educational opportunities that really exceeded his expectations. Kinchen will visit Northwestern on Friday before returning to Washington.